Kushiel’s Curse continues the adventures of Moirin mac Fainche, now on a quest to find her lover, Bao, who has run off to determine his own fate after their Master Lo sacrificed himself to help Moirin unwittingly bring Bao back to life. Half of Moirin’s soul spark, or diadh-anam, now resides with Bao, guiding her towards him, but making him uncertain of whether or not his feelings for her are genuine. Leaving Chin behind, Moirin travels through many of the lands of Carey’s world, all of which are based on the real world. Carey seems to be making a point of covering the entire world in her books, with this one crossing Mongolia and India and the next book completing the world tour with the west. Through the Alban side of her heritage, Moirin is also a child of the bear goddess, the Maghuin Dhonn. The gifts from these goddesses are manifest in Moirin and this brings her to the attention of a particular Yeshuan Rebbe intent on cleansing her of all those sins and lead her and other sinners to salvation. When this occurs about a quarter of the way into the book, it got my back up. In the second book of Carey’s adventures in Terre D’Ange, readers are introduced to the Habiru, worshippers of Yeshua and the One God. Due to my Christian upbringing, I tend to balk when I have to deal with the religious beliefs I rebelled against in my youth (unexpectedly) showing up in my entertainment and taking a very prominent role. It’s clear that the cultures and religions in this series are all based on actual cultures and religions and it is very easy to identify them all, so it shouldn’t be a surprise to me to find the Christian god’s involvement – especially since the gods of Terre D’Ange are birthed from that very faith. My prejudice usually isn’t enough to make me turn away, and I appreciated the way Kushiel’s Chosen presented it as something more for its main character, Phèdre, to learn and comprehend in order to achieve her goals. 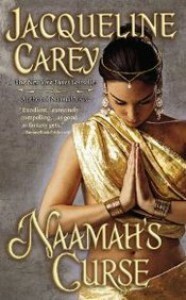 In fact, as the books progress and more cultures and religions earn some focus, Carey does so with great care and respect through her characters. But, unlike the previous adventures with Yeshua where I could get over my religious prejudice because the telling was never delivered with preachiness or condemnation, Moirin’s introduction to the Habiru, it is nothing but preachy and condemning. As Moirin tries to justify her religious beliefs and subsequent actions to her captors, it felt a lot like it was Carey herself trying to unapologetically validate the “love as though wilt” principle and the licentious behaviour of her D’Angeline people. As if Carey had suffered criticism from some right wing Christian group and needed to vent her frustrations within the story. Later, when Moirin travels to Bhodistan, Carey’s disguised opinion piece moves to the condemnation of the caste system and the Untouchables of India. I would have liked to avoid comparing Moirin to her predecessor, Phèdre no Delauney, but Moirin does it often enough herself. Moirin also spent a lot of time reiterating events from past books. In her travels, she frequently is asked to tell her story from Namaah’s Kiss, so if you haven’t read that one, you almost don’t need to. But she also goes into a lot of detail about certain events that took place during Imriel de la Courcel, who had his own trilogy in Carey’s Terre D’Ange series. Everything is raised within context, but I found the repetition tedious. There is a heavy reliance on magic. Originally, the gods’ involvement in the world was clear, but not as heavy handed as it has been with Moirin. All of her decisions are based on the commands of her diadh-anam and plans rely on her ability to “summon the twilight” or make use of her many other abilities. This isn’t necessarily a bad thing, but it is something that has struck me since the Imriel Trilogy, becoming almost the entire focus in Moirin’s Trilogy. The theme is that the gods use their chosen hard, as established with Phèdre but Phèdre made choices that in some cases, meant defying the gods. I don't expect Moirin to be Phèdre but I grew disappointed in the way Moirin seemed to be the sum of her god-chosen status, without actually making decisions herself or really even questioning her destiny. I was disappointed that we really don’t get to spend enough time with Bao and Moirin being together, though I know that was a necessary part of the story of Moirin’s love traversing all obstacles to be with him. I guess that just means I’ll have to read the third book in Moirin’s Trilogy to get my satisfaction! My final complaint goes to the narrator, Anne Flosnik. I was not fond of her slow speech and the voices she affects for the characters other than Moirin, who tells the story. I particularly did not enjoy the drawn out, hoarsely whispered voice she uses for Bao. It did not match my image of Bao (as portrayed by Godfrey Gao in my head) at all. Not to mention that Flosnik pronounced all the words I’ve been reading for the past seven books entirely *wrong*, of course. Otherwise, the narration was tolerable, but I will definitely be reading the next book myself. Despite all the complaining, I actually did like the book. It dragged a bit more than I felt was necessary, mainly because of some of the issues I addressed above, but it was still enjoyable. The characters are all as richly defined as I've come to expect from Carey, and I care about them enough to find out what happens next.